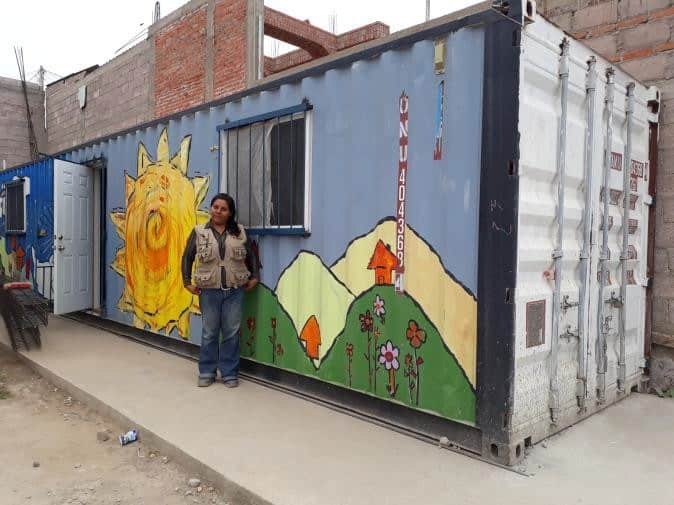 Thanks to the generous support of Homes for Living Hope, in 2014 Urban Mosaic was able to begin the process of bringing tangible hope to San José las Palmas in the form of a shipping container that would become a community health center, the only one of its kind in the entire community of over 15,000 residents. After the long-awaited arrival, due to a three-year delay in customs at the US-Mexican border, in October 2017 we received the shipping container late one evening, and it was received with joy by several of the neighbors who are involved in our programs. Since then, we have begun the necessary preparations to launch the health center in the coming months, including getting the objects that were initially contained in the container shipped from the border to Mexico City. These finally arrived on April 15th, 2018. 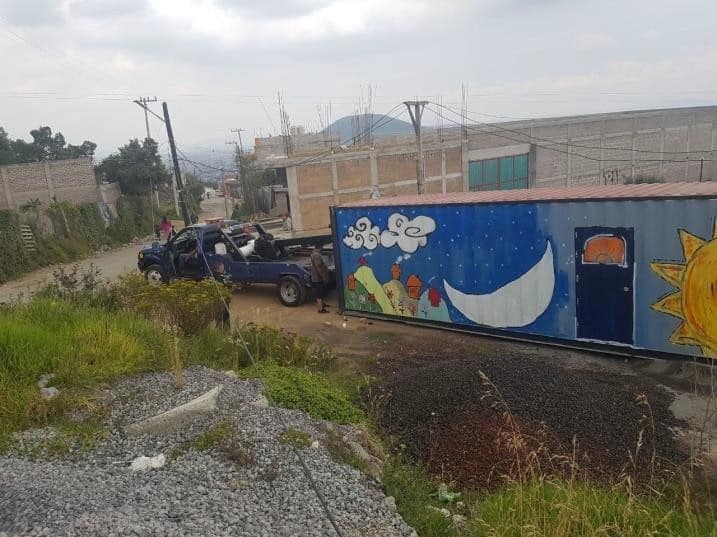 We installed the container in its permanent location, directly adjacent to our community center which will provide other services like a day care, online high school, training center, church worship meeting, extreme soccer field, and waiting room for the health clinic. The combined community and health center will create a safe gathering place and a focal point for the entire community. Pictured on the left is our community health project coordinator, Yolanda, who will oversee all the operations and programs related to the medical center through our community health initiative, ProSalud. We are excited to report that the health center will be officially inaugurated on May 19th in a community celebration where the mayor and other municipal dignitaries from the city’s health department will participate. From September 2018 onward, we will provide 30-40 medical consultations per week, with the help of a doctor, orthodontist, nurse, nutritionist and social worker from the city’s health department who will see patients twice a week, additional aspiring medics through UNAM’s residency program, and other volunteer doctors who will offer their specialized services (a gynecologist, optometrist, and two chiropractors will come once a month while a renowned oncologist will come every three months). Lastly, throughout the process, we will seek out in-kind donations (medication, wheelchairs, toothbrushes, ) to provide to enrolled participants and reduce their overall health costs. 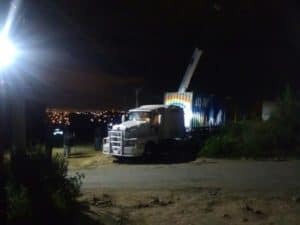 Currently, the medical container is equipped with an area for x-rays, exam table and an area for consultations with instruments to measure weight and height, glucometers and various medications. Soon the dental examination room will be opened. With our existing partnerships with local universities and even the municipal government, we also have identified the medical personnel who will staff the health center. All of the operations of the community health center will be run through our ProSalud community health initiative, which focuses on decreasing the incidence of preventable diseases in its target communities and liaising with existing services to improve access to curative health care for residents. Lastly, ProSalud builds trust and relationships between neighbors, in order to improve social cohesion and contribute to a healthier civil society. community health promoters and 120 families inscribed in ProSalud and will have 25 promoters and 250 families involved in family health clubs by the end of 2018, which all will have access to the health center. The “Healthy Home” program provides health education to families to prevent common illnesses, gives regular follow-up to participating families, helps residents access the governmental health system and builds more social cohesion by strengthening relations among neighbors. Thank you to Homes of Living Hope for your contribution and long patience during this difficult process of obtaining the medical container. In the end, your effort was worth it, and the health center which you helped build will go on to impact the lives of thousands of urban poor residents in the community San José Las Palmas in Mexico.